← How well do you know your universe? This guy isn’t one of my faves, but I’m going to give him a nod on account of Tim Curry played him. Ask any actor what roles are the most fun, and they’ll inevitably tell you they like to play the villain. As someone who once portrayed the Wicked Witch of the West in our high school production of The Wizard of Oz, I admit that I auditioned for that role specifically. I had my reasons. Among them was the fact that the part of Dorothy was almost guaranteed to the girl who reminded us all of a young Judy Garland (big voice, sweet face and all). I also wanted a chance to be intimidating, volatile and powerful. In other words, a whole lot of things that I’m not on a daily basis. So imagine what happens when an agent tells their actor, “Hey, the Wachowski brothers want you to play the Devil!” It’s the artist’s ka-ching, is what. Since writing has replaced acting for me, I get my kicks watching how these cinematic Satans are characterized. There are so many different interpretations out there. There’s the malevolent, sociopathic, purely evil Lucifer. There’s the Miltonian rebel. And then there’s the Devil that’s a composite of all these moving mythologies. For your entertainment, I’ve narrowed it down to my top 3, if for no other reason than a good Devil is hard to find. Before I go on, I want to apologize to those who expected to see Al Pacino on the list. I like The Devil’s Advocate as much as the next guy, but if I’m honest, Pacino’s John Milton (real subtle) is too…conventional. He’s exactly the Devil you’ve always heard about. And I’ll be the first to agree that it works in the context of the movie. But me, I’m looking for compelling characterization. So here’s the countdown. What’s not to like about old George? He’s cool-headed, not judgemental in the least, and gives you exactly what you want, exactly how you asked for it. He’s handsome, has a great sense of humour, and enjoys long walks along London streets doling out generous quantities of daily mischief. He may be a fallen angel, but he has a good reason: he got tired of his glorification duties. As punishment, he’s now the world’s greatest trickster. But don’t blame him. As he judiciously points out, he’s just doing his job; aka, God’s will. I’m a little ashamed that I didn’t pick up on the name clue at first. I guess I got distracted by the detective story and the voodoo subplot. What I like most about Louis Cyphre is best summed up by my friend, who said, “I love a Devil who plays by the rules.” And how does he do that? For one, he never actually tells Harry Angel that he’s the one they’re looking for. Instead, Louis leads the private investigator down a path that will make him draw that conclusion himself. Kind of passive-aggressive, you’ll say, but them’s the rules in the Job story, right? You can’t beat him up directly, but you can destroy everything that has meaning in his life. In Angel Heart, Louis Cyphre strips Harry Angel of his perceived identity, and helps him remember that he’s actually Johnny Favorite, a ruthless murderer who made a deal with the Devil. And now the Devil’s collecting. Interestingly enough, this Devil doesn’t do any evil. None, in fact. The best part, though, is how deliciously creepy Robert De Niro is in this role. Most people remember the short BMW movie directed by Guy Ritchie and starring Madonna. Beat the Devil was another instalment in that series. Also starring Clive Owen as the driver, the story follows James Brown as he tries to renegotiate his contract with the Devil, who gave him fame and fortune in exchange for his soul. Gary Oldman’s turn as the Prince of Darkness is part Jean-Baptiste Emanuel Zorg, part Ziggy Stardust, and pure Oldman. The movie’s a bit jerky but the style is flawless. Funny to stumble onto this post of yours: I just revisited “Legend” the other day (it doesn’t hold up aside from the art direction and costumes) and thought about how much Curry’s Darkness shaped my vision of the devil. To me, that is exactly what the devil looks like. Glad to see “Angel Heart” make the cut — classic flick. To me, Legend is an unregenerately terrible movie. 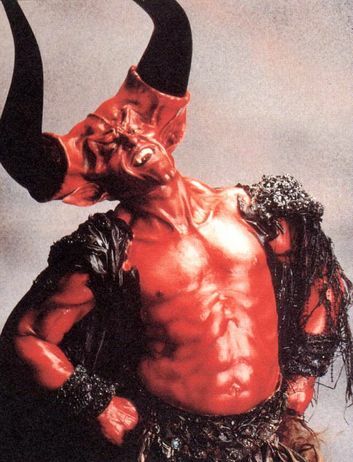 But there’s nothing awful about Tim Curry’s performance. He’s so committed to every role he takes, you completely forget that he’s the one playing it. He was my favourite thing about Oscar, Sylvester Stallone’s only bout with comedy.